Adobe Photoshop 5.0 software packages (Adobe Systems, Inc.,. Mountainview, CA). ..... course, is a general limitation of studying gallstone pathogen- esis, which has to be kept in ... Laboratory for Advanced Microscopy. The project was par-. crossreactivity in immune response.Phil. Trans. R. Soc. Lond. B352, 11â20. (doi:10.1098/rstb.1997. 0002) ... Calvez V, Korobeinikov A, Maini PK. 2005 Cluster. Abstract Mathematical models have been used extensively in the optimization of hot rolling schedules. They are cost effective tools in reducing mill trials and give guidance in the directions to follow when either schedule parameters or chemical compositions are changed. However, the existing models were usually derived from laboratory parametric equations, obtained with the inherent limitations of attainable processing variables, in particular strain rates. The present paper introduces a model for austenite grain size evolution during thermomechanical processing in which the focus is hot deformation schedule optimization with lean chemistry designs. 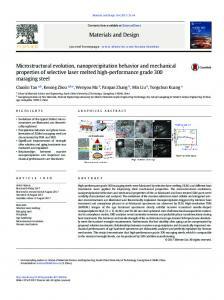 Very often, nowadays, expensive elements such as Cr, Mo and Ni, among others, have been used to promote adequate microstructure and mechanical properties. By using the model presented in this paper, a hot rolling schedule can be examined from the point of view of the fundamentals of physical metallurgy and, if possible, optimized both in terms of processing parameters and chemical composition. The model has been used to design a lean microalloyed chemistry which was then tested in an industry trial. Results showed that reasonable mechanical properties can be obtained and that the model can be used for the purpose of industry scale alloy designing. size type of model and a grain size distribution type. In the first class, the microstructure is represented by an “average grain” with a certain grain size incoming a pass. The second type follows how a distribution of grains go in and out of a rolling pass. In most practical rolling cases, the average type model gives a reasonable description of “microstructure evolution”. Grain size distribution models, however, are better applied to more stringent cases; for instance, a compact strip mill rolling . Here, the slab entering the first pass has an as cast microstructure, that is, a mixture columnar and chill zone grains. Having a through product cross section homogeneous microstructure is a strong requirement in any rolling process. So, in this case, following small and very big grains during rolling makes sense since the breakdown of big grains can be monitored. This technology of modelling and application to hot rolling is already very well stablished for flat products. However, this technology is not very often applied to long products. Furthermore, most of previous published works were either restricted to CMn chemistries or were not validated against industry data, such as Hodgson and Gibbs , Maccagno et al , and Manohar et al . The present paper introduces an application of the average grain size model to a wire rod industry schedule. Validation of the model is carried out against industry data. 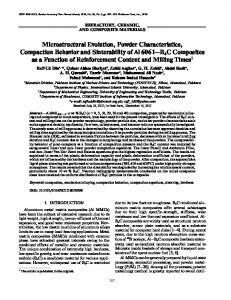 The paper is divided into the following sections: a) introduction of the model, b) validation of the model using industry data, c) calculation of mechanical properties and alloy cost and d) discussion of “what if” scenarios considering schedule productivity, mechanical properties improvements and alloy design optimization. THE MODEL The model was built using equations for kinetics of recrystallization initially proposed by Hodgson and Gibbs  and later modified by Siciliano  and Pereda et al . 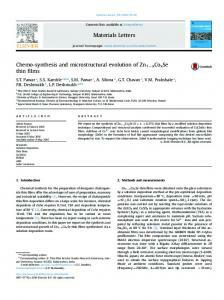 Grain growth was calculated using equations recently proposed by Uranga et al  for Nb microalloyed steels. Precipitation kinetics for Nb(C,N) was calculated using Dutta and Sellars model  recently reviewed and modified by Medina et al . A summary of the equations used in the model is given in Table 1. INDUSTRY TRIALS Figure 1 shows the layout of the mill used in the trials. It is a continuous mill in which 29 passes are given. The passes are divided into three stages: roughing, pre-finishing and finishing. After the last pass, the wire is cooled in a water box, sent to a laying head and put on a Stelmor conveyor. The chemical composition of the steel is 0.16 C, 0.68 Mn, 0.021 Nb, all numbers in weight percentage, and 20 ppm of N. The model predicts that 100 % of Nb(C,N) was dissolved at a temperatures of 1100 oC. Reheating temperature was set at 1150 oC. Figure 2 gives details of the temperature profile of the schedule. Note that passes 1 to 6 are given at temperatures above 1000 oC. Passes 7 to 23 are applied around 950 oC and 24 to 27 above this temperature. Water boxes after passes 27 and 31 reduce these temperatures back to 950 oC. The profile contrasts with that for flat products in respect to the fact that during finishing the temperatures are always dropping. Essentially, hot rolling of wire rod treated here is a process in which 7 passes are given above 1000 oC and the remainder passes in between 950 and 1000 oC, the majority of which are given around 950 oC and not below this temperature. Values of equivalent strain given in each pass are relatively high, in between 0.35 and 0.70. Most passes were given at temperatures ranging from 950 to 1000 oC. The time spent in the complete process, from rehating furnace to Stelmor conveyor entrance is about 80 s: 15 s during roughing, consisting of 4 passes, 30 s transporting the bar from roughing to finishing entrance and 25 s during pre-finishing and finishing, passes 5 to 29, making 26 passes in total. The average interpass time is then just shy of 1 s. These conditions, short interpass time, high temperature and, as earlier mentioned, relatively high strains per pass may induce dynamic recrystallization, as suggested in the literature [1,2,4]. On the other hand, strain induced precipitation might or migh not occurs under these conditions and it will be interesting to see the guidalines given by the model in such case. stress value of 454 MPa and an ultimate tensile stress of 566 MPa, quite close to the measured values. A more fundamental approach calculation of yield stress can be made considering the chemistry composition and the amount of Nb precipitates formed in the austenite and in the interface austenite-ferrite. Considering the increase in yield stress due to precipitation hardening, taking Orowan-Ashby model with volume fractions of precipitates in the austenite as 15 x 10-5 % and in the ferrite as 7 x 10-5 %, the sizes of the precipitates as 6 nm in the austenite and 4 nm in the ferrite, gives an increase of 42 and 36 MPa in the yield stress. The sum of these two components gives an increase of approximately 80 MPa which when added to the ferrite grain size (Hall-Petch) effect and to the contribution of the base chemistry composition gives also values of predicted yield and ultimate tensile stress very close to the measured values. Alloy design and costs Equations (1) and (2) can be used to optimize chemical compositions considering several constraints. Assume, for instance, a hypothetical demand to produce long product following good steel making, casting, rolling industry practices and yet maintaining good weldability and hydrogen crack resistance. Assume further that the objective is to obtain yield stress 450 MPa, ultimate tensile stress 550 MPa and Pcm levels smaller than 0.20. Table 3 presents alloys which comply with these requirements. The alloys were obtained from an optimization function which targets were getting the values of the mechanical properties just mentioned with restrictions imposed to the alloy design such as to follow the also just mentioned good practices in the industry in order to get a sound product and yet minimizing cost. 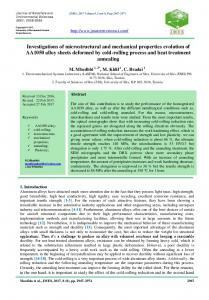 Alloy #1 was designed considering minimum levels of Mn as 0.6% and Si as 0.2%. The optimum solution was obtained with 0.2% Cu and 1% Si to get the mechanical properties needed. 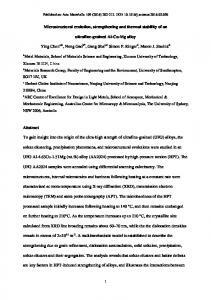 However, Si too high is deleterious to steelmaking practices. Then alloy #2 was designed imposing restrictions on Si maximum of 0.5%, so in effect, Si content could vary between 0.2 and 0.5%. This implied in a reduction of C and Cu and an increase in Mn content. However, Mn was too high so a restriction was imposed in Mn levels to a maximum of 1.5%, that is Mn could vary between 0.6 and 1.5% only. An optimum alloy was this time reached as seen in alloy #3 in the table. Finally, all the above restrictions were considered and Nb was added to the steel. 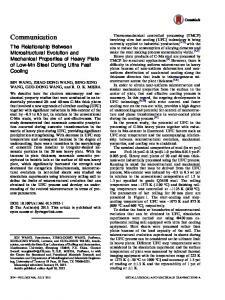 In this case, Cu and Ni were not necessary to be added to the steel to get the mechanical properties required and, although C content had to be increased, Pcm was 0.19, the smallest in all alloys. In an attempt to move C content out of the perithetic range, Nb content was slightly raised to 0.034. Optimization of this alloy led to a decrease in Mn to 0.6 and a lower Pcm, 0.16. Relative cost index (RCI) did not changed as seen in Table 3. The last column of the table shows an exercise in cost appraisal of the chemistries just suggested. A “relative cost index” was computed considering market costs of iron alloys only, that is, not taking into account other production costs. It is interesting to see that the relative cost index increases steadily as the number of restrictions also increased, from alloy #1 to #3. On the other hand, alloy #4 presents the smallest relative cost index of all alloys, although the same restrictions were imposed to this alloy as it was for all others. This is due to the Nb addition. 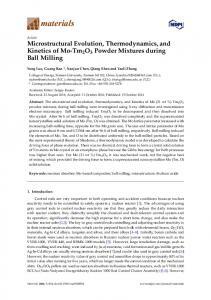 The reasoning is simple; since YS and UTS values depend on ferrite grain size as well as on chemistry. Nb reduces ferrite grain size, as it is well known. Moreover, Nb also contributes to precipitation strengthening as just seen. These two contributions allow for achieving the YS and UTS values required using a leaner chemistry. P. D. HODGSON and R. K. GIBBS, ISIJ International 32, (1992), p. 1329. T. M. MACCAGNO, J. J. JONAS and P. D. HODSON, ISIJ International 36 (1996), p. 720. P. URANGA et al, ISIJ International 44 (2004), p. 1416. 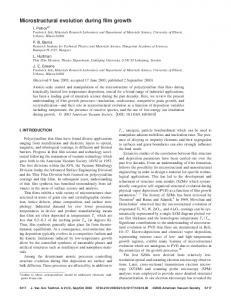 P. A. MANOHAR, K. LIM and Y. LEE, ISIJ International, 43 (2003), p. 1421. F. SICILIANO and J. J. JONAS., Met Trans A, 31A (2000), p. 1769 B. PEREDA, J. M. R. IBABE and B. LÓPEZ, ISIJ International, 48 (2008), p. 1457. P. URANGA et al., Proceedings AISTech (2016), p. 1769. B. DUTTA and C. M. SELLARS, Materials Science and Technology 3, (1997), p. 197. S. F. MEDINA, A. QUISPE, A. and M. GOMEZ, Met Trans A, 45A (2014), p. 1524. A. I. FERNÁNDEZ et al., ISIJ International, 40 (2000), p. 893. S.F. MEDINA and A. QUISPE, ISIJ International, 41 (2001), p. 774. C. IPARRAGUIRRE et al. 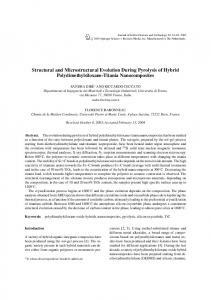 2007, Materials Science Forum, 539-543 (2007), p. 4119. M. PIETRZYK, C. ROUCOULES and P. D. HODGSON, ISIJ International, 35 (1995) p. 531 T. SENUMA et al., Tetsu-to-Hagane, 70 (1984), p. 322. R. ABAD et al., ISIJ International, 41 (2001), p. 1373. L.Q. MA et al., Multidiscipline Modeling in Materials and Structures, 3 (2007), p. 27. 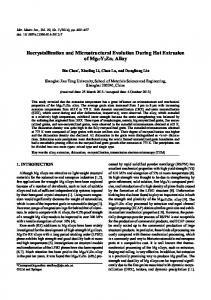 Report "Mathematical model of microstructural evolution and ..."